Xocai Power Squares uses cacao that produces a high antioxidant dark chocolate that boasts 8 times the levels of epichatechins and catechins, and 4 times the levels of procyandins that cacao produced with standard processing. Xocai Power Squares are loaded with antioxidants and flavonoids. The Xocai Power Squares are the most powerful, health promoting, decadent chocolate ever produced! The dynamic blend of Cacao, Acai berries, and Blueberries makes Xocai Power Squares the most potent antioxidant product available! With the Brunswick Labs Certification Program, you DON'T have to play the guessing game, YOU KNOW WHAT YOU ARE GETTING! 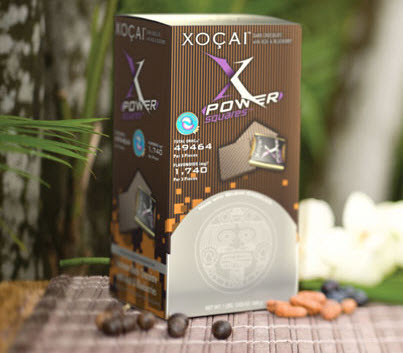 Xocai Power Squares uses a patented unprocessed cacao formulation process optimized with Acai berries and Blueberries to create an extremely high antioxidant formula unlike any other. Xocai Power Squares contain no artificial colors, no artificial flavors, and no fillers. Order Xocai Power Squares here today! Xocai Power Squares ORAC and Nutrition link.